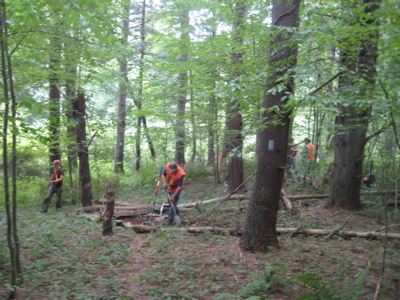 Note: This section ties in with The Tunxis Nepaug Regional trails. My multi-year trek up the disjointed Tunxis from Southington to Burlington has been an interesting one. 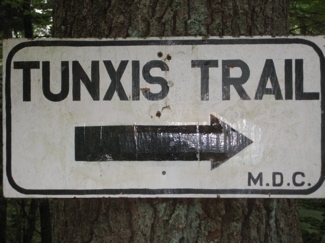 The Tunxis has a distinct personality – even though it traverses some of the most varied geography as any other trail in the state. 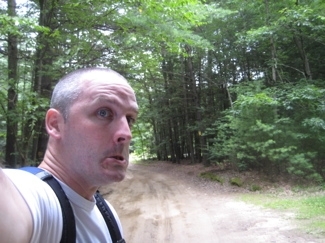 I loved the network down in Burlington; rich with history and the trails themselves were fun to complete. The southern sections were slightly weird to me only because they traversed the ridge above Lake Compounce and begin and end at rather random places. 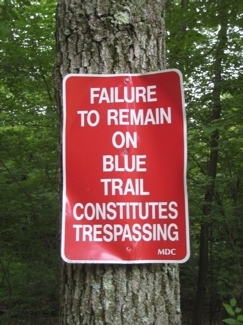 I’d hiked the Nepaug regional Tunxis trails a while back and wasn’t overly impressed. But still, I was very much looking forward to getting back out on the Tunxis and getting further up the trail… Even if my previous Tunxis partner, Rob Y, was home with a newborn. No worries, he’d already done much of this section over the years and besides, we both knew it wouldn’t be the best part of the trail. Of course, hiking solo requires some creative car management and double-backing, but I’m used to that by now so I won’t bother with my crazy explanations. Just be assured that I hiked every foot of this section, often twice. Which made it doubly weird and just that much more evil. Yeah, that should set the mood… On the way to Satan’s Kingdom. Mwuh-huh-huh hyuhhhh. 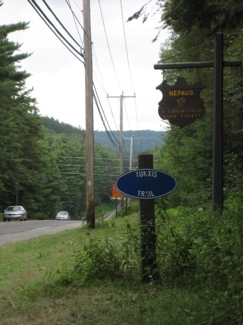 The Nepaug Mainline section starts after about a mile and a half of a jump from the end of the last (Burlington) section on Route 4. 2015 Update: As you may have heard, the CFPA closed the Burlington gap in late 2014, so now there is only one gap in the Tunxis, down in Bristol. And I, your humble narrator, have gone through the 10 different pages of CTMQ that this change affects. You’re welcome. 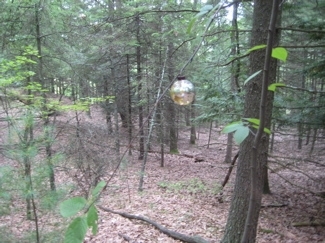 Nearing the trailhead on Hotchkiss Road, which is deep in the Burlington woods, I encountered my first ominous sign. As I slowed to be sure not to miss the trail, I passed a group of teenagers swimming in Bunnell Brook. They glared at me, the outsider, and seemed to be daring me to stop and ruin their fun. I didn’t, but another group of punks in a car appeared behind me from a side dirt woods road and tailgated me for no reason as I drove away from the gathering. I pulled over to the side at the trailhead and looked at them as they passed. They all stared at me and then tore off into the woods down the road. Weird. 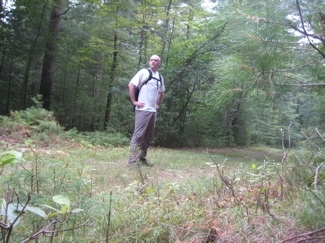 Before I got going on the trail, I crossed the road towards Bunnell Brook to check out the ruins that I noticed there. It turns out that this is the former Hotchkiss Watch factory but I couldn’t find the sign commemorating the site that’s supposed to be there. 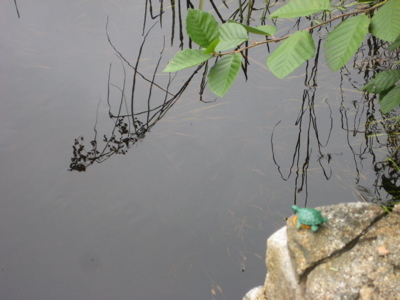 I didn’t look too long, so maybe I’ll return some day and search more earnestly. 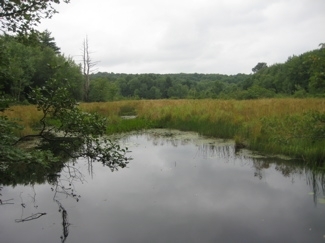 The land across the brook looked primordial and dark. 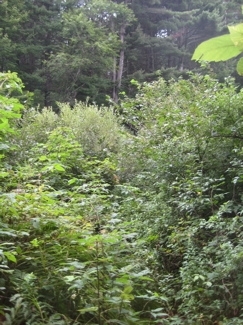 The brook cuts a deep ravine and the forest was primarily pine, hemlock and ferns. But I wasn’t going that way, so I re-crossed the road, double-checked my door locks, looked around for any sign of more hooligans coming my way and began climbing into the woods. And so began one of the stranger treks I’ve ever done. I can’t really put my finger on it, and I never felt scared or anything like that… It’s just that strange things kept popping up along the way. You’ll see what I mean. 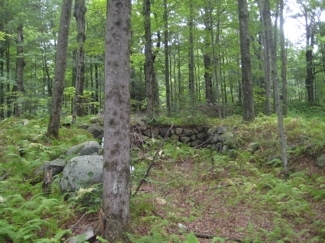 Just as the trail begins, it passes the remains of the Hotchkiss residence. It’s a rather large stone foundation and one can imagine Old Man Hotchkiss watching over his watch making operation down the hill at the creek, here in what is still relatively “out there” Burlington. Heck, I guess it was actually more bustling back when the factory was operational. The entire stretch of the Tunxis from Hotchkiss Road to Route 202 traverses almost exclusively on MDC land. 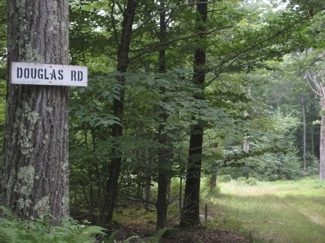 As such, most of the hike is along MDC forest roads which strangely, have names and actual road signs here. I’ve hiked a lot of MDC land in my day and I don’t recall seeing road signs nailed to the trees. See, that’s not scary in the least – just weird. 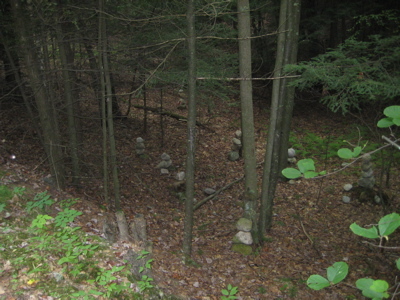 I walked down the level Smith Road for a while and after ten minutes or so, I started noticing little rock cairns over in the woods on the left side of the trail/road. At first, there were just a few small ones a few feet into the woods, but in short order, there were more. Many more. In fact, for about a quarter mile stretch, there were over a hundred of these things, sometimes as deep into the woods as I could see. Kids build these things all the time, but someone really put in a monumental effort here. There appeared to be two to three hundred in all, each built the same way and not in any real pattern. Craziness! 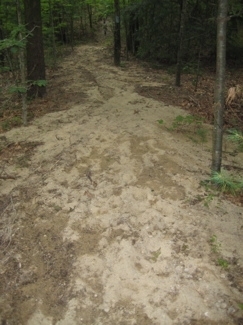 Then the trail veers off the road into the woods up a steep little hill for no discernible reason. It’s blazed just fine, but now instead of hundreds of little cairns, I was confronted with a bunch of Christmas Tree balls. It wasn’t even the fact that it was August, as this would be weird in December. Who would bother to do such a random thing? A goofy MDC worker with a lot of, ahem, balls? I thought there would be just one or two, but no… the balls picked up where the cairns left off and they were hung on trees for the next mile or so. Craziness! The next section of trail was thankfully pretty dull; up and over Garrett Mountain along Douglas Road and then west along Garrett Road. 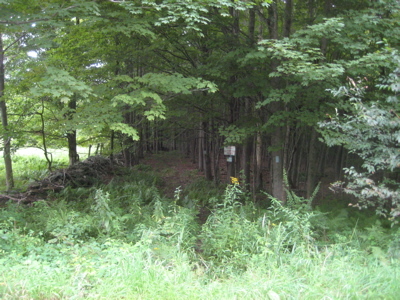 There are some steep sections (down) here as the trail descends down to the Nepaug River. I left the road an up over a saddle and then back down to the road again for no discernible reason. Which wasn’t until after a short walk down Southeast Road where I walked right by a bunch of chickens in the road. That’s right, I said chickens in the road. I didn’t take a picture because some farmer boy was weed whacking very near the chickens and staring at me as if I was the weird thing in the tableau and not the chickens in the road. 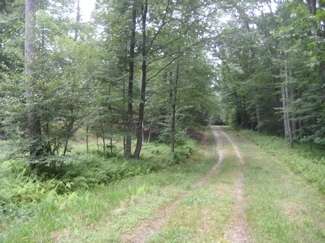 The trail turns off the road after a little while and cuts the corner of Southeast Road and Route 202. The corner cutting surely improves trail safety as 202 is not a very hiker friendly road, but there was a problem during my hike. The trail was nowhere to be found. I saw the first few blazes which took me very near some power lines but then it simply disappeared as it approached the Nepaug River again in a mess of brambles and shrubs. I can’t think of another time any of the CFPA trails has just disappeared. I’ve lost trails before, but this was frustrating. Again, I’m sure it’s been re-cleared and re-blazed in the interim, but I actually ended up turning back (and this is where I jogged down roads – Southeast to Covey to Smith into the woods back over to the trail and down to my car, if you must know). “No.” Oh well, so I suppose CL&P (or whomever) will do what they need to do and the trail may just stay over on the road after all. Time will tell. This little snippet of land is noted as a pine plantation in the Walk Book, and it is pretty neat – another reason that the trail makes the effort to go through here I suppose. Once up onto Route 202 and across the river, the trail heads north again into the Nepaug State Forest and the area I’ve previously explored via the Tunxis Regional Trails there. I have a love-hate relationship with this area. There are some beautiful spots and some interesting features, but it is a managed logging area scarred with dirt roads all over the place. This makes it very inviting to ATV, Jeep, and dirt bike riders who always seem to be tearing around the woods when I’m there. They do seem to stick to the maze of logging/forest roads, but their presence can be menacing and certainly is annoying. Once on top of the rise, though, the erosion sort of dissipates and there are some decent views to the west of Bee Mountain. I only mention that because I enjoy the name, “Bee Mountain.” After this jaunt through the woods and down the other side of the hill, the rest of this section travels on those forest roads – many of which are actually open to traffic. Some of these roads offer shortcuts (I guess) because I’ve seen several non four-wheel drive cars plodding along through these woods. 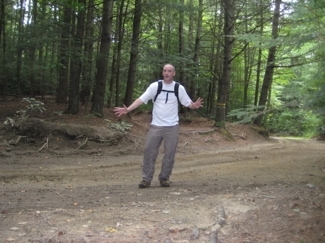 The final mile or so up Satan Kingdom’s Road affords hikers the opportunity to hop off the main Tunxis to do some of the loop trails I’ve previously described (Again, here). Since I’d already walked the length of Satan’s Kingdom Road, this was my stop and turn-around point for the day and I headed back to my car of off Route 202. 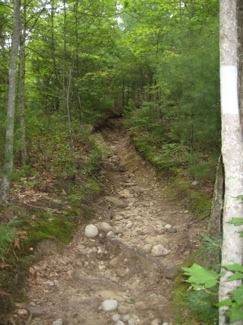 But just to complete the trail’s description, the road sort of deteriorates to become a rutted rocky mess as it crests a hill just before becoming paved. 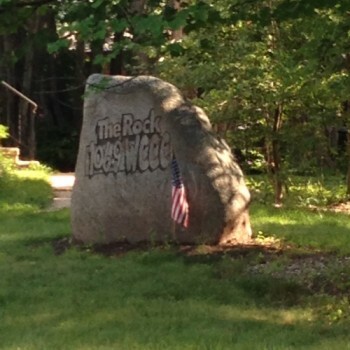 Yes, people do actually live on Satan’s Kingdom Road. The trail walks its entire length, from the middle of the woods, to the half-mile paved section out to Route 44. It does veer off the road for a short section, to better view the Farmington River a bit better. The “gorge” alongside the road is called “Satan’s Kingdom Gorge” and truth be told, it really is one of the deeper gorges in the state. (We don’t have that many.) I wouldn’t want to fall down it, that’s for sure. Anyway, the trail crosses the Farmington River here via the Route 44 bridge and then heads north towards it’s terminus up near the Massachusetts border. There is a huge parking lot across route 44 from the trail at the Satan’s Kingdom Recreation area, so if you’re going south or north on the trail, it’s a good place to start. I have heard and read that the remaining miles of the Tunxis are some of the most remote and beautiful of the entire state’s trail network. I can confirm that “Crappy section” between Southeast Rd. and 202 is still crappy. 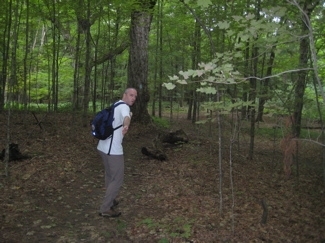 I didn’t lose the trail, but the undergrowth was very thick and mostly poison ivy. I’ve been working on jogging all the Tunxis trails in Burlington, and this one was the most annoying, worse than the stretch of the mainline off of Old Field Rd. on Johnnycake Mtn. Rd, which was poison ivy and prickers. At least that opened up after 100 ft or so.